The question of the relationship between micro-level and macro-level is just as important in physics as it is in sociology. Is it possible to derive the macro-states of a system from information about the micro-states of the system? It turns out that there are some surprising aspects of the relationship between micro and macro that physical systems display. The mathematical technique of “coarse-graining” represents an interesting wrinkle on this question. So what is coarse-graining? Fundamentally it is the idea that we can replace micro-level specifics with local-level averages, without reducing our ability to calculate macro-level dynamics of behavior of a system. We study the predictability of emergent phenomena in complex systems. Using nearest neighbor, one-dimensional Cellular Automata (CA) as an example, we show how to construct local coarse-grained descriptions of CA in all classes of Wolfram’s classification. The resulting coarse-grained CA that we construct are capable of emulating the large-scale behavior of the original systems without accounting for small-scale details. Several CA that can be coarse-grained by this construction are known to be universal Turing machines; they can emulate any CA or other computing devices and are therefore undecidable. We thus show that because in practice one only seeks coarse-grained information, complex physical systems can be predictable and even decidable at some level of description. The renormalization group flows that we construct induce a hierarchy of CA rules. This hierarchy agrees well apparent rule complexity and is therefore a good candidate for a complexity measure and a classification method. Finally we argue that the large scale dynamics of CA can be very simple, at least when measured by the Kolmogorov complexity of the large scale update rule, and moreover exhibits a novel scaling law. We show that because of this large-scale simplicity, the probability of finding a coarse-grained description of CA approaches unity as one goes to increasingly coarser scales. We interpret this large scale simplicity as a pattern formation mechanism in which large scale patterns are forced upon the system by the simplicity of the rules that govern the large scale dynamics. This paragraph involves several interesting ideas. One is that the micro-level details do not matter to the macro outcome (italics above). Another related idea is that macro-level patterns are (sometimes) forced by the “rules that govern the large scale dynamics” — rather than by the micro-level states. Coarse-graining methodology is a family of computational techniques that permits “averaging” of values (intensities) from the micro-level to a higher level of organization. 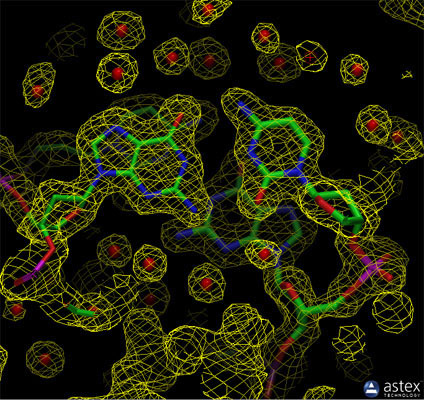 The computational models developed here were primarily applied to the properties of heterogeneous materials, large molecules, and other physical systems. For example, consider a two-dimensional array of iron atoms as a grid with randomly distributed magnetic orientations (up, down). A coarse-grained description of this system would be constructed by taking each 3×3 square of the grid and assigning it the up-down value corresponding to the majority of atoms in the grid. Now the information about nine atoms has been reduced to a single piece of information for the 3×3 grid. Analogously, we might consider a city of Democrats and Republicans. Suppose we know the affiliation of each household on every street. We might “coarse-grain” this information by replacing the household-level data with the majority representation of 3×3 grids of households. We might take another step of aggregation by considering 3×3 grids of grids, and representing the larger composite by the majority value of the component grids. Note that this is the weak form of emergence (link); Israeli and Goldenfeld explicitly postulate that the higher-level properties can be derived (“extracted”) from the micro level properties of the system. So the calculations associated with coarse-graining do not imply that there are system-level properties that are non-derivable from the micro-level of the system; or in other words, the success of coarse-graining methods does not support the idea that physical systems possess strongly emergent properties. Does the success of coarse-graining for some systems have implications for supervenience? If the states of S can be derived from a coarse-grained description C of M (the underlying micro-level), does this imply that S does not supervene upon M? It does not. A coarse-grained description corresponds to multiple distinct micro-states, so there is a many-one relationship between M and C. But this is consistent with the fundamental requirement of supervenience: no difference at the higher level without some difference at the micro level. So supervenience is consistent with the facts of successful coarse-graining of complex systems. What coarse-graining is inconsistent with is the idea that we need exact information about M in order to explain or predict S. Instead, we can eliminate a lot of information about M by replacing M with C, and still do a perfectly satisfactory job of explaining and predicting S.
Suppose we are interested in simulating the physical process through which a pot of boiling water undergoes sudden turbulence shortly before 100 degrees C (the transition point between water and steam). There seem to be two large alternatives raised by Israeli and Goldenfeld: there may be a set of thermodynamic processes that permit derivation of the turbulence directly from the physical parameters present during the short interval of time; or it may be that the only way of deriving the turbulence phenomenon is to provide a molecule-level simulation based on the fundamental laws (algorithms) that govern the molecules. If the latter is the case, then simulating the process will prove computationally impossible. The coarse-graining is an approximation procedure widely used for simplification of mathematical and numerical models of multiscale systems. It reduces superfluous – microscopic – degrees of freedom. Israeli and Goldenfeld demonstrated in [1,2] that the coarse-graining can be employed for elementary cellular automata (CA), producing interesting interdependences between them. However, extending their investigation on more complex CA rules appeared to be impossible due to the high computational complexity of the coarse-graining algorithm. We demonstrate here that this complexity can be substantially decreased. It allows for scrutinizing much broader class of cellular automata in terms of their coarse graining. By using our algorithm we found out that the ratio of the numbers of elementary CAs having coarse grained representation to “degenerate” – irreducible – cellular automata, strongly increases with increasing the “grain” size of the approximation procedure. This rises principal questions about the formal limits in modeling of realistic multiscale systems. Here K&D seem to be expressing the view that the the approach to coarse-graining as a technique for simplifying the expected behavior of a complex system offered by Israeli and Goldenfeld will fail in the case of more extensive and complex systems (perhaps including the pre-boil turbulence example mentioned above). I am not sure whether these debates have relevance for the modeling of social phenomena. Recall my earlier discussion of the modeling of rebellion using agent-based modeling simulations (link, link, link). These models work from the unit level — the level of the individuals who interact with each other. A coarse-graining approach would perhaps replace the individual-level description with a set of groups with homogeneous properties, and then attempt to model the likelihood of an outbreak of rebellion based on the coarse-grained level of description. Would this be feasible?